Safely outside the New York City limits, St. Thomas College was supposed to promise peace and quiet. Unfortunately, English professor Alison Bergeron has found it to be anything but. She recently divorced a fellow faculty member and, more recently, her car was stolen. Then one evening, she gets a visit from two homicide detectives from the NYPD. The good news is that they found Alison's beat-up Volvo; the bad news is that the body of one of the students in her Shakespeare seminar was in the trunk. Now, not only must Alison continue to hoof it to campus (a fate almost worse than death), she's become a prime suspect for a murder she did not commit--and her efforts to clear her name have landed her in hot water with an even hotter Detective Bobby Crawford, who happens to be a former altar boy, and the sinfully suspicious nuns of St. Thomas. All hell's about to break loose if Alison can't find the real killer…before it's too late. 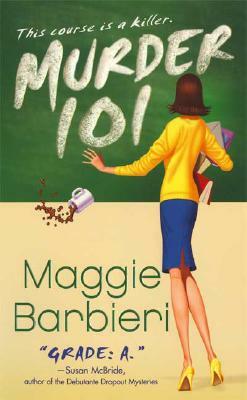 Maggie Barbieri is a freelance textbook editor as well as a mystery novelist. Her father was a member of the New York Police Department, and his stories provide much of the background for her mysteries. She lives in Westchester County, New York. "If you love Agatha Christie, Sue Grafton, and Sara Paretsky, you'll be delighted by Murder 101." --Sheila Curran, author of Diana Lively Is Falling Down "Grade: A."